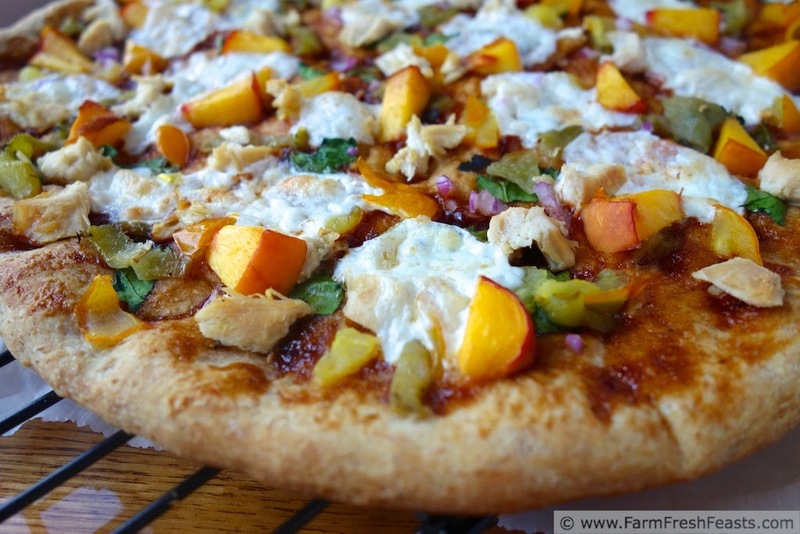 Fresh peaches and freshly roasted Hatch chile peppers paired with spinach, mozzarella, and chicken on a BBQ-sauced buttermilk pizza crust. There are no guarantees in life, and that's OK.
We have two peach trees in our backyard (they belong to my daughter) but that's not a guarantee we'll be eating homegrown peaches this summer. Just like official orchards here in southwestern Ohio, the extreme cold temperatures of late winter were too much for the delicate buds. No flower buds means no flowers, and no flowers means no local peaches. That's just how it is sometimes. I'm sorry to be down. As I'm writing this, it is Wee Oliver Picklepants' Last Day. A year ago when I made this pizza I didn't even know he existed. Then my deployed spouse went on the internet and found Oliver and his Traveling Companion, Vincent. My spouse asked me to adopt the dogs and I did, falling in love with those nice middle aged gentlemen long before he returned and met them. 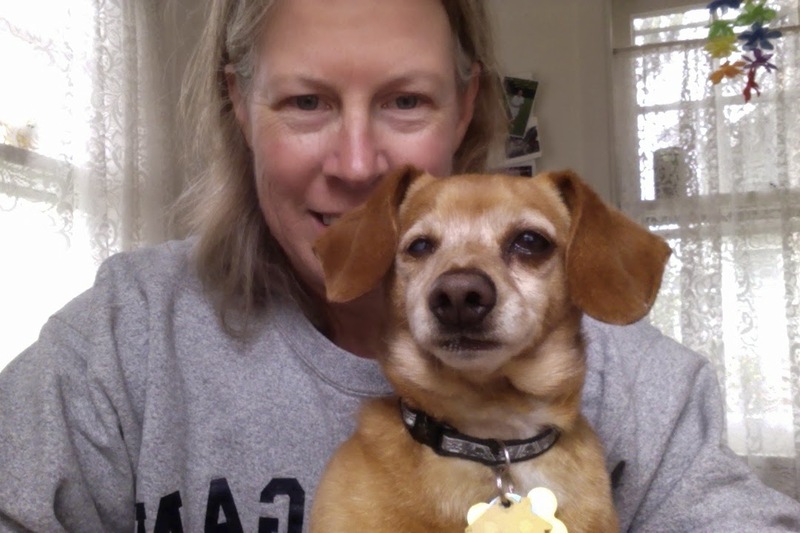 I was particularly smitten with Oliver, a runty 10 lb one eyed wiener dog mix. An avid outdoorsman, Oliver holds the title of being the only dog in the house to successfully catch a squirrel [technically, most of the squirrel got away, but Oliver was darn proud of the tufted tail tip that was left behind]. Such an active lifestyle was too much for Oliver's back, though, and his pain got to be unmanageable. 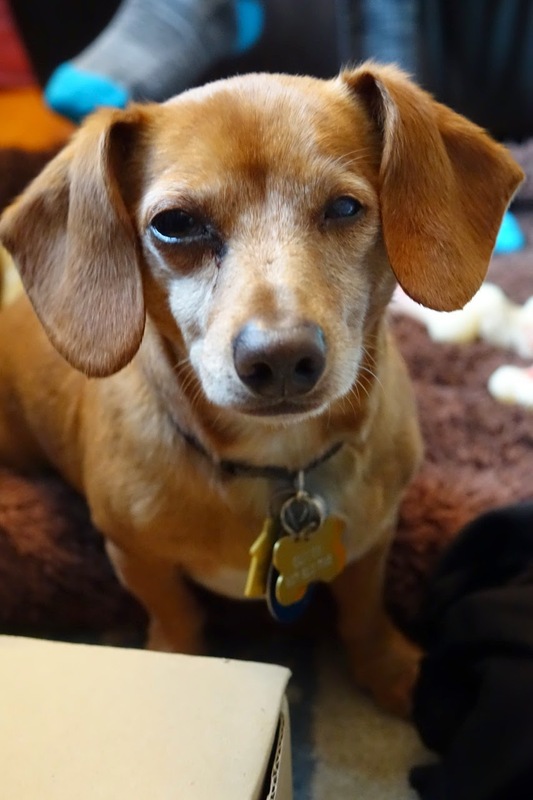 We will miss him--his sweet disposition and outsized personality changed our minds about little dogs. Despite my sadness about peaches and pups, I am glad we have options when it comes to buying fruit. The fruit farmer at the farmer's market down the road is bringing in peaches from South Carolina to sell alongside their summer berries. While it isn't as good for their bottom line, it does keep their customers happy and I'd rather buy my out-of-state peaches at the farmer's market than the grocery store, you know? 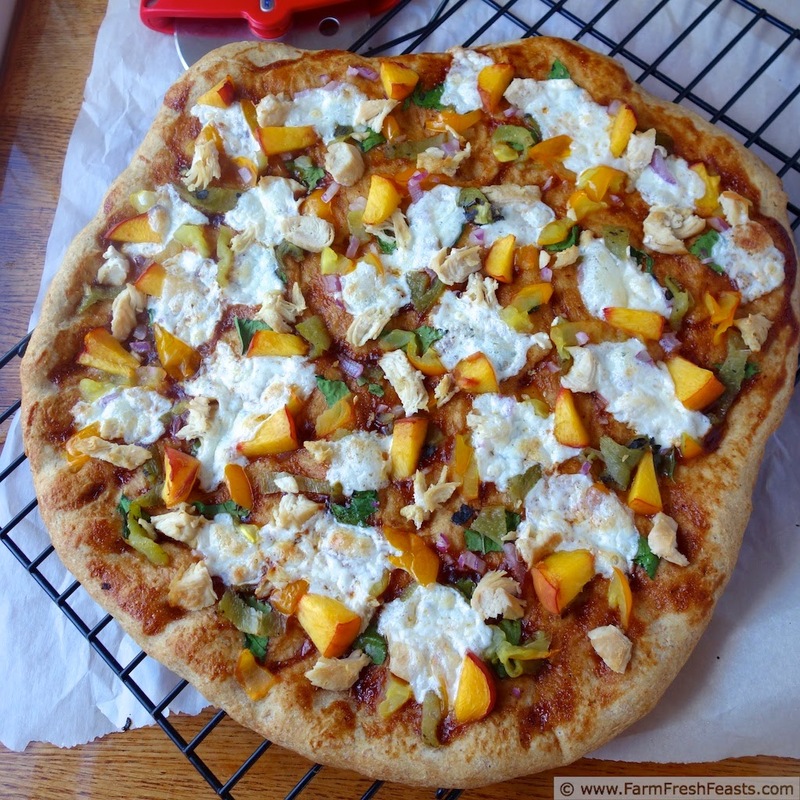 For my 3rd peach pizza recipe (following Peach, Basil and Brie pizza and Peach and Pepperoni Pizza) I decided to get gourmet and throw a bunch of stuff together. Biting into this pizza was amazing. Even before that point, though, just seeing the colors made me happy. 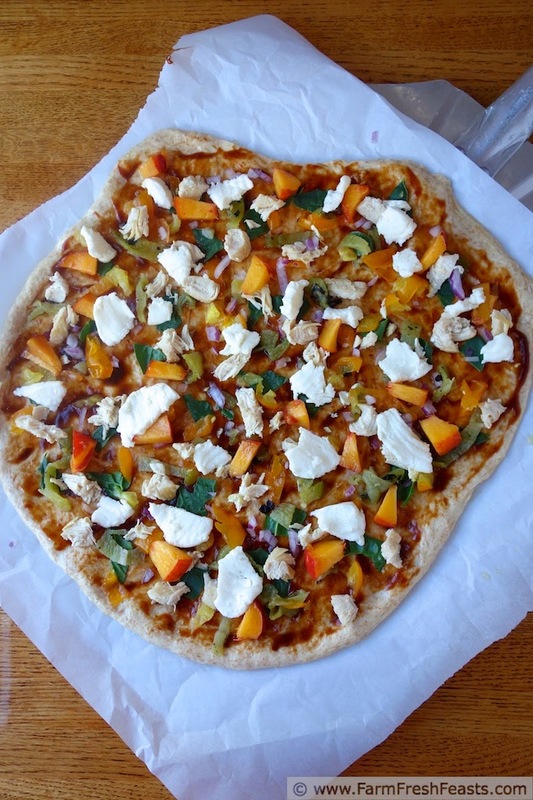 The warm colors of the peaches were set off by the greens of the spinach from our Community Supported Agriculture (CSA) farm share and accented by fresh mozzarella and red onion. I know that you eat with your eyes first, but the flavor has to back it up and this pizza delivers. 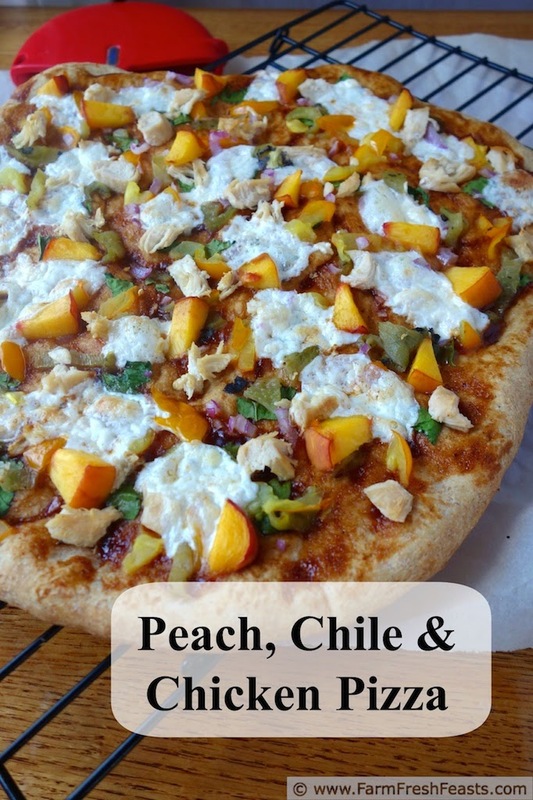 The sweetness of the fresh peach chunks paired with spicy roasted Hatch chiles and creamy mozzarella is complemented by the BBQ sauce base. Give it a try--it's really good. Preheat oven to 425 degrees Fahrenheit. If you've got a pizza stone, for heaven's sake use it by preheating it in your oven. If not, no worries, use a cookie sheet. On an oiled piece of parchment paper, stretch out dough into the shape that works for you today. Spread BBQ sauce close to edges of dough. Top with spinach, chicken, chiles, peach and onion. 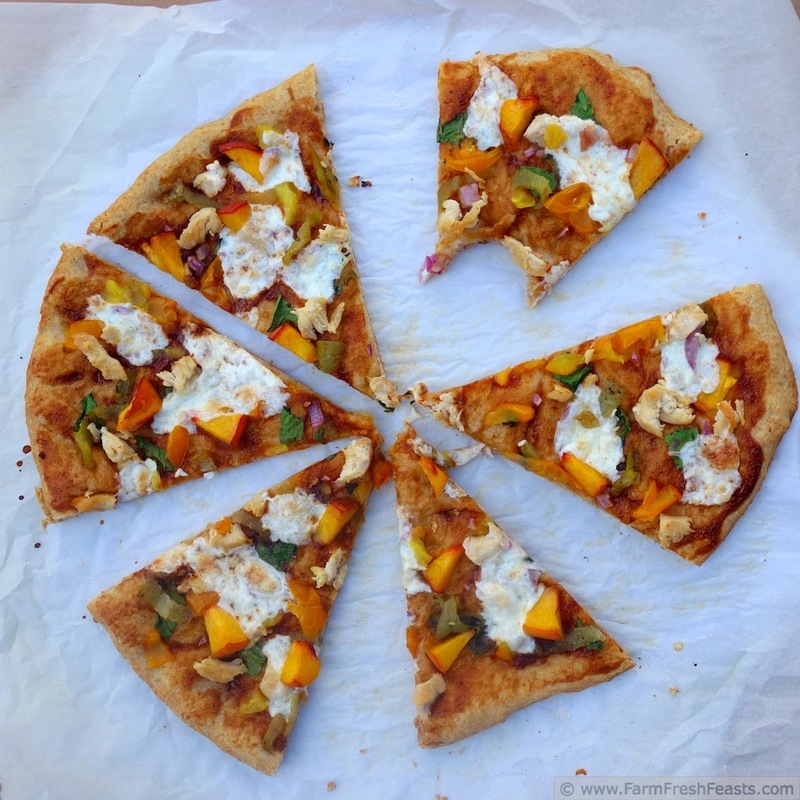 Scatter pieces of fresh mozzarella across the top. Bake on the parchment paper for 5 to 8 minutes, then shimmy the pizza off the parchment paper and bake directly on the stone (or cookie sheet) until the cheese is bubbly, another 3 to 5 minutes. Cool on a rack, then slice and serve. Earlier this year Oliver was driving the computer during a G+ HOA. Kirsten... I'm so sorry about Oliver. I know what it's like to lose a pet - they're family. All I can say is that at least you got to love him while he was here and you gave him a good life. I'm so sorry. PS. I'm not sorry you posted this recipe. Pinned. WILL def be making in the near future. xoxo - let me know if i can do anything. The pizza is beautiful and so was Wee Oliver. I know how much he touched you in the time you had him, and I'm glad he made you so happy. I was so sorry to hear you had to let him go. A peach pizza is genius, and we loved the Beet Blueberry Muffins so now I can officially say I will eat my beets as well as drink them. Wee Oliver was a peach. A fitting tribute. I'm so sorry, you didn't get enough time with him. I try to remind myself that everyday with my dog is treat because their time is short. Now I'm crying... Ok, I would really love it if you would bring this recipe by foodie friday today. I'm sorry to make you cry, but thankful that a fellow dog lover gets it.